On the morning of May 5th, it was time to leave DeSoto State Park. Except for our first few days of bad weather, our stay here was awesome. Loved the campground, great hiking trails and a lot to see and do in the area. Would we return here? Most definitely yes (preferably not during tornado season though). Prior to leaving DeSoto, we talked about visiting Asheville where we wanted to visit the Biltmore Estate, but we so enjoyed being surrounded by nature we weren’t sure we were up for staying in a more congested area. 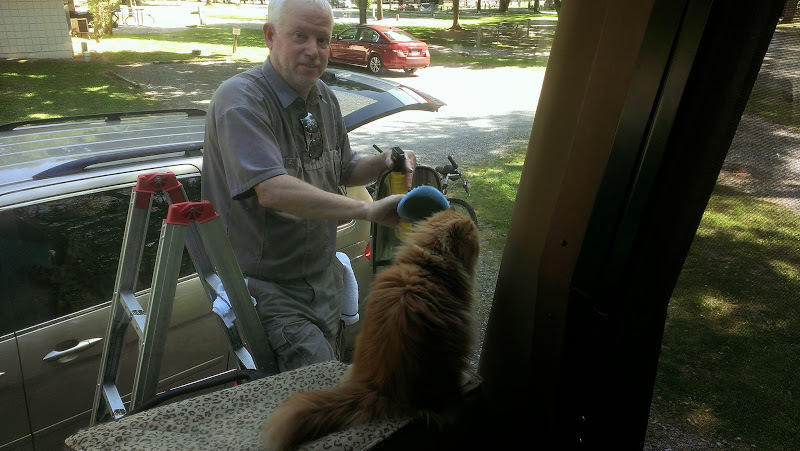 When our next door neighbors at DeSoto, Beth and Charley, recommended a campground near the Great Smoky Mountains National Park, we decided that visiting there sounded much more appealing. 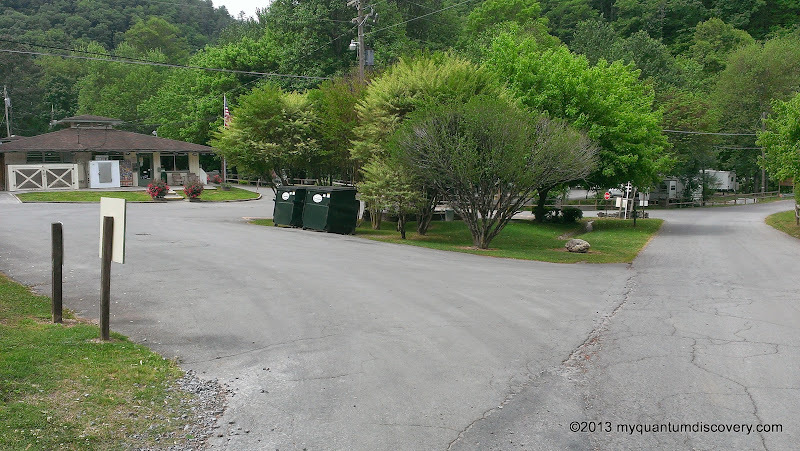 Back in 2000, before we began our RV lifestyle, we had rented a cabin at Brother’s Cove in Sevierville for a week and had always talked about returning, so this was the perfect opportunity for another visit. And so it was that our next destination became Tremont Outdoor Resort in Townsend, TN about a 3-1/2 hour drive. As we left the campground, we once again had to maneuver the curve next to the rather large rock formation. Not too bad if there isn’t a car coming from the other direction but still a little nerve wracking to say the least. Then it was another ride through Fort Payne where we picked up I-59N heading towards Chattanooga. As a side note, if you are in a big rig we strongly recommend sticking to the main roads when arriving or leaving DeSoto State Park. From the park take DeSoto Parkway (AL-89) heading south to AL-35 towards Fort Payne, then either north or south on AL-11 to get to I-59. You DO NOT want to take Beason Gap Road like your GPS might suggest. Likewise, it’s not advisable to take DeSoto Parkway north out of the campground. Both of these routes include at least one 180 degree switchback and very steep inclines. After an uneventful drive north on I-59 we arrived in in Chattanooga, TN where we picked up I-75N. From there it was more uneventfulness until we took exit 81 to US-321 in Lenoir City, TN. US-321 is mostly four lane divided, but there is a short section through a mountain pass where it narrows to two lanes – otherwise this is a fine road. After passing thru Townsend we continued on to TN-73 for a mile or so then turned left into the Tremont Outdoor Resort at Stables Drive. Note that there isn’t a sign for the resort on the main road (TN-73) so it would be easy to miss the turn. 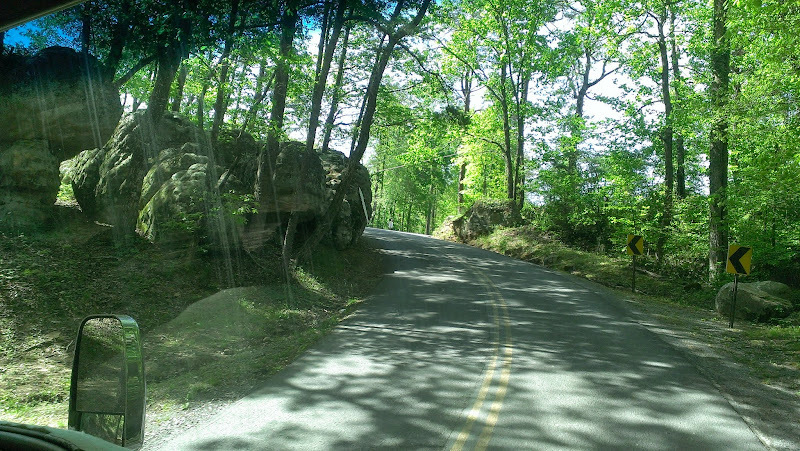 We don’t suggest missing the turn as you will soon thereafter find yourself in Great Smoky Mountain National Park. 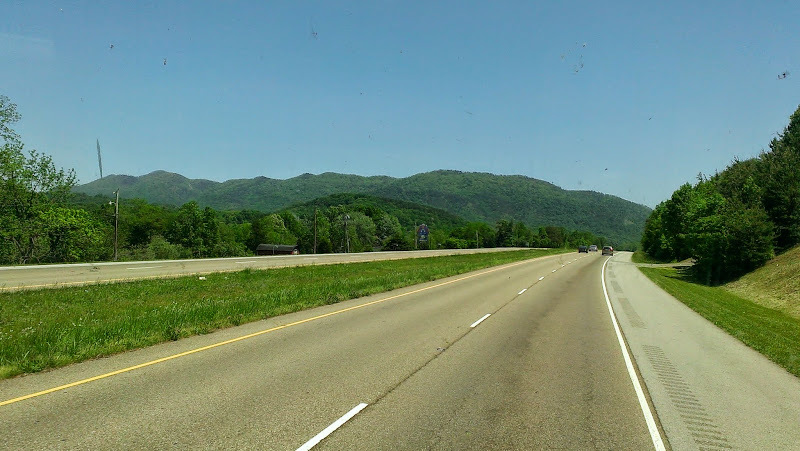 You could probably turn around at the intersection of TN-73 and the road to Cade’s Cove, but If not, follow the road to Cade’s Cove and the campgrounds there, you do not want to take a big rig onto TN-73 towards Gatlinburg! Tremont Outdoor Resort has 90 full hook-up sites (29 sites directly on the river) with either 30 or 50 amp electrical service, free wifi (which worked quite well for us) and Cable TV. Tents are not permitted in the full service sites, however, an additional 23 sites are available with water and 30 amp service best suited for tents or pop up trailers. From March 1st to May 31st, riverfront 50 amp sites are $42, non riverfront are $40. If you stay 7 nights, you get a 10% discount. After we checked in the office where we were assigned to B-33, we drove to our site. I have to admit initially I wasn’t too impressed with the campground (certainly didn’t seem to qualify as a “resort”) but that quickly changed once we were parked. 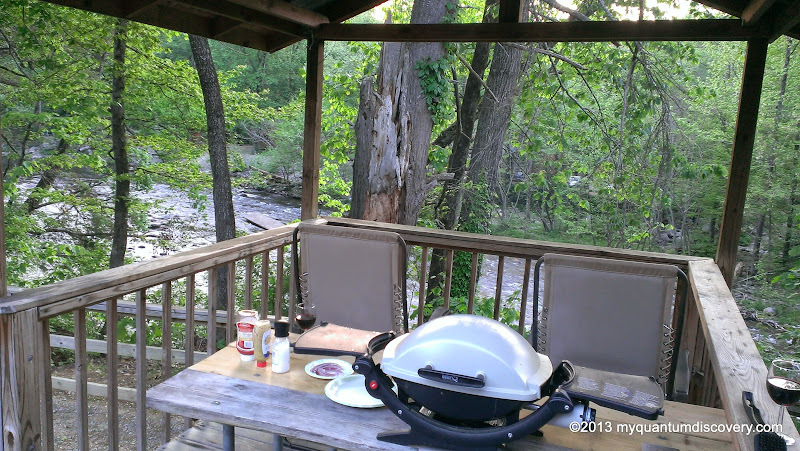 A back-in site, a gazebo with a picnic table, and a view and the sounds (rather loud but pleasant) of the rapids on the Little River about 50 feet below (yes, the same Little River that we saw in AL). Our initial impression soon changed to wow, how cool is this! 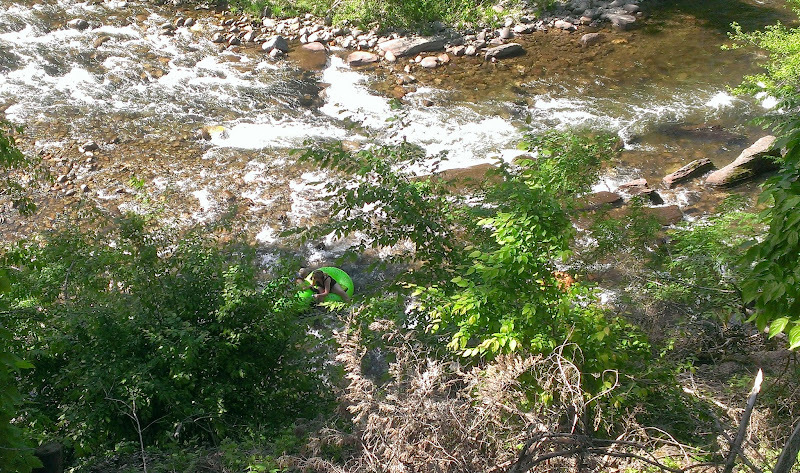 Shortly after our arrival we soon discovered, it came with entertainment – folks were tubing down the rapids the entire time we were there. Fun watching them float on by! And then several days later, more entertainment as a bald eagle flew upstream, then five minutes later flew downstream right in front of us (darn, couldn’t grab the camera fast enough). More wow! It did have a fire ring but it was located a short distance away from the river so if you were sitting next to the fire you wouldn’t be able to see the river. We so enjoyed sitting at the gazebo even after dark that we never had a campfire. When we initially made our reservation, we wanted to stay 6 nights but site B-33 wasn’t available the entire time which meant that for our last two nights we would have to move to site B-16. Although that site was still on the river, it was fairly close to the main road and on a section of the river without rapids. We did change our plans though (more about this later) so we never had to make the move to the second site. Once we settled in, we decided to move the picnic table slightly so we could fit our lounge chairs in the gazebo. We spent the rest of the afternoon enjoying the sights and sounds of the river and making our sightseeing plans. Stay tuned for what we did in the area! Don’t you just love it when something turns out much better than expected? Looks like a great campground!